1 7/8" Wide x 1 7/8" High. 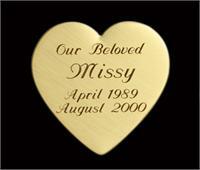 Maximum 4-Line engraving included at no additional cost. For Representation of type style, please make your choice from dropdown. Rainbow Bridge Urns will not be responsible for typographical errors made when ordering.